Gunn will speak at 7 p.m. Sept. 12 in the Benes Rooms of Hamilton-Williams Campus Center, 40 Rowland Ave., Delaware. Gunn served in the South Carolina House of Representatives from 2009 to 2011 and with the U.S. Department of Health and Human Services from 2010 to 2014. At the Health Department, “Mr. Health Care” helped to share information about the Affordable Care Act and to develop strategy for building and maintaining relationships with health care providers, private-sector companies, business and labor groups, and other constituents. Learn more at www.antongunn.com. Ohio Wesleyan faculty member Randolph Quaye, a trained medical sociologist, is the director of this year’s Sagan National Colloquium, which annually explores an issue of national or international significance from multiple academic perspectives. “Is health care a fundamental right for all citizens, or is it a privilege for a few?” asks Quaye, an associate professor of black world studies. “Should market forces determine access to health care? What role, if any, can governments play in health care? What can the USA teach the world about how not to reform health care? What policy implications are envisaged in health systems driven by the public sector? What are the major global health challenges facing the world? Are we prepared for the next pandemic? Additional presentations scheduled for the 2017-2018 Sagan National Colloquium are as follows. Unless otherwise noted, all events will be held in the Benes Rooms. For more information, including any schedule changes, visit www.owu.edu/snc. • 7 p.m. Sept. 18 — Heather Lane and Adam Howard, Delaware General Health District. • 7 p.m. Sept. 19 — Mike Abrams, president and CEO of the Ohio Hospital Association. • 7 p.m. Sept. 21 — Daniel Derksen, the Walter H. Pearce Endowed Chair and Director of the Arizona Center for Rural Health (AzCRH), and professor and chair of the Community, Environmental, and Policy Department at The University of Arizona’s Mel and Enid Zuckerman College of Public Health. • 7 p.m. Sept. 26 — Katherine von Stackelberg, research scientist at the Harvard Center for Global Health and the Environment, and an affiliate at the Harvard Center for Risk Analysis. • 7 p.m. Sept. 28 — Lise Van Susteren, practicing general and forensic psychiatrist, and clinical professor of psychiatry at Georgetown University. She will speak in Room 301 of Merrick Hall, 65 S. Sandusky St., Delaware. • 7 p.m. Oct. 5 — Laxmi Mehta, director of the Women’s Cardiovascular Health Program and associate professor of internal medicine at The Ohio State University Medical Center. • 7 p.m. Oct. 16 — David Williams, the Florence and Laura Norman Professor of Public Health at the Harvard T.H. Chan School of Public Health, and professor of African and African American studies and sociology at Harvard University. • 7 p.m. Oct. 17 — Menen Hailu, writer, director, and producer for Young Voices, New Dreams. She will speak in the Phillips Hall auditorium, 50 S. Henry St., Delaware. • 7 p.m. Oct. 24 — Deborah McFarland, professor in the Department of Global Health and the Department of Health Policy and Management at the Rollins School of Public Health of Emory University. • 7 p.m. Oct. 26 — Joseph White, Luxenberg Family Professor of Public Policy and director of the Center for Policy Studies at Case Western Reserve University. • 7 p.m. Nov. 2 — Christopher Fink, associate professor of health and human kinetics at Ohio Wesleyan University. • 7 p.m. Nov. 7 — Tasiana Njau, psychologist and faculty member at Muhimbili University of Health and Allied Sciences, and a clinician at Muhimbili National Hospital in Dar es Salaam, Tanzania. • 7 p.m. Nov. 9 — Cecilia Makafu, technical director of ICAP Global, Health, Action, under the management of Columbia University in Tanzania. • Nov. 7 to Dec. 14 — Art Exhibit, “Together: Superheroes.” This exhibit features artists with developmental disabilities from Ohio-based Creative Foundations and examines how artists collaborate or conceptualize relationships in their work. The exhibit will be located in the front hallway gallery of the Richard M. Ross Museum, 60 S. Sandusky St., Delaware. Call 740-368-3606 or visit www.owu.edu/ross for information. 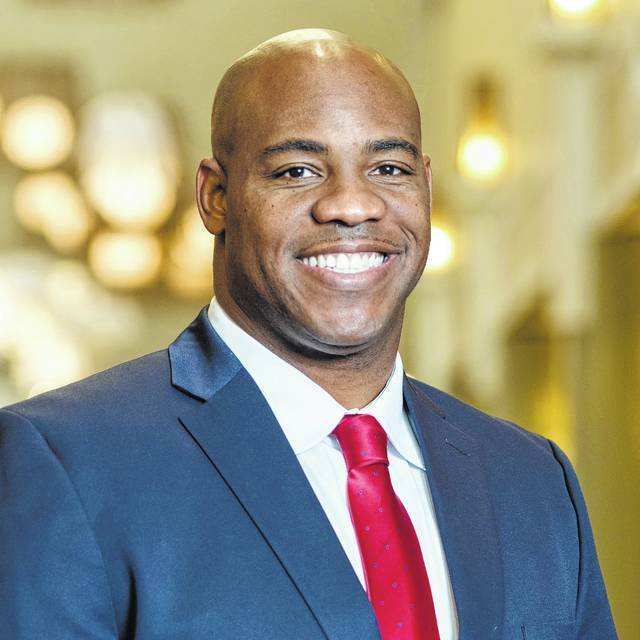 Former Obama administration staff member Anton Gunn will kick off Ohio Wesleyan University’s Sagan National Colloquium on Tuesday, Sept. 12. Gunn will speak at 7 p.m. in the Benes Rooms of Hamilton-Williams Campus Center.